WASHINGTON — A Delta 2 rocket lifted off Sept. 15 carrying a NASA Earth science satellite on the final flight of a vehicle whose heritage dates back to the beginning of the Space Age. The United Launch Alliance Delta 2 lifted off from Space Launch Complex 2 at Vandenberg Air Force Base in California at 9:02 a.m. Eastern. The primary payload, NASA’s Ice, Cloud and land Elevation Satellite 2 (ICESat-2), separated from the second stage about 53 minutes after liftoff, followed by four cubesat secondary payloads more than 20 minutes later. ICESat-2 is a successor to the ICESat satellite that collected information on ice cover and other Earth science data from 2003 to 2010. Northrop Grumman Innovation Systems built the satellite, which weighed 1,514 kilograms at launch. The spacecraft’s sole instrument is an improved laser altimeter called Advanced Topographic Laser Altimeter System (ATLAS), which is designed to fire 10,000 laser pulses a second to obtain elevation data with an accuracy of half a centimeter. ATLAS will primarily be used to measure the elevation of ice sheets and changes in their size, but will also measure the height of vegetation on land. The launch was the 155th and final flight of the Delta 2, which first launched in February 1989. Once a mainstay of both government and commercial customers, the vehicle went through a gradual phaseout after the U.S. Air Force shifted payloads like GPS satellites to EELV-class rockets, including ULA’s Atlas 5 and Delta 4 and, more recently, SpaceX’s Falcon 9. Commercial customers also moved to larger launch vehicles, leaving NASA as the primary user in the vehicle’s final years. 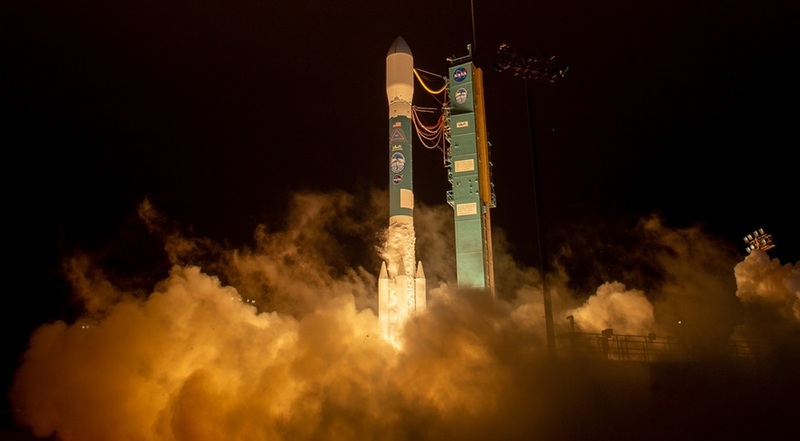 This launch, which was the 100th consecutive successful Delta 2, brought back a tradition from earlier Delta 2 missions. “We used to put stars on the vehicle to represent the number of successful launches we had, but several years ago we took those stars off,” said Scott Messer, manager of NASA programs at ULA, during the prelaunch briefing. One more Delta 2 exists, but will not be launched. Instead, ULA President and Chief Executive Tory Bruno announced after the ICESat-2 launch that this final Delta 2 will be given to the Kennedy Space Center Visitor Complex to be put on display in its “Rocket Garden” of launch vehicles.